Released as part of the Glenfarclas' Family Cask collection, The Glenfarclas Family Cask Trunk contains every vintage made by the Speyside distillery between 1954 and 2003. Glenfarclas sales director George Grant said: ‘This is a once-in-a-lifetime opportunity to buy a full collection of vintages in a complete set. The Glenfarclas Family Cask Trunk contains 50 200ml bottles of Glenfarclas single malt, one from each year. The custom-made trunk also contains four tumblers, four nosing glasses and a water jug, all made by Scottish glass manufacturer Glencairn Crystal. Also included in the trunk are four slate coasters, three hand-printed and bound leather books with information on the history of the distillery, George Grant’s tasting notes for each vintage, and a book for the buyer’s own tasting notes. 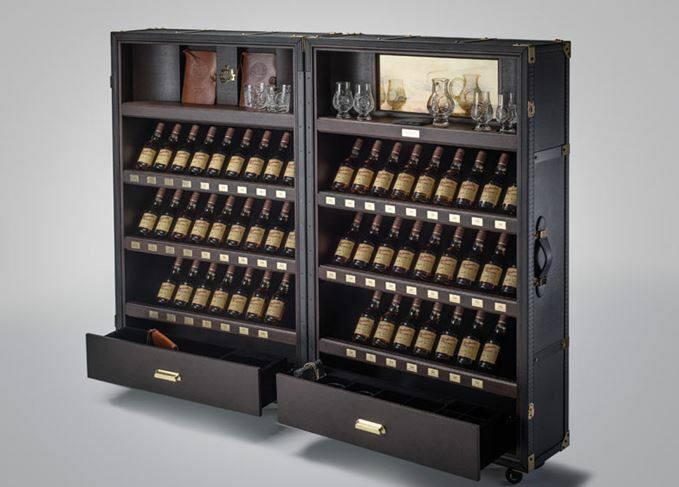 A total of 60 of The Glenfarclas Family Cask Trunks are available globally. In 2007, family-owned Glenfarclas launched a collection of whiskies called The Family Casks, a series of 43 single cask, vintage single malts spanning five decades. The next release in the Family Casks series is due to be introduced in spring 2019. The 1920 malt is believed to be the oldest unopened bottle of Glenfarclas in existence. Three legendary (and rightly so) SMWS bottlings, including the very first from the society. The ambitious series of single cask bottlings now spans six decades from the 1950s. A chance encounter with a knowledgeable bartender was the beginning of a life-long love for whisky. This week’s flavour theme is ‘big’, featuring BenRiach, Glenfarclas, Tamdhu and Timorous Beastie.